Super Savings Item! Save 31% on the MTECH USA MT-20-57BK Fixed Blade Hunting Knife, Black Blade, Black Rubberized Handle, 12.5-Inch Overall by MTECH USA at Vet Center Store. MPN: MT-20-57BK-MC. Hurry! Limited time offer. Offer valid only while supplies last. The MTech USA Fixed Blade Hunting Knife (model MT-20-57BK) features a black blade and a black rubber coated handle, with a 12.5-inch overall length. The MTech USA Fixed Blade Hunting Knife (model MT-20-57BK) features a black blade and a black rubber coated handle, with a 12.5-inch overall length. This fixed blade military style knife features a 7-inch, 3.5mm thick black stainless steel fixed blade with sawback. 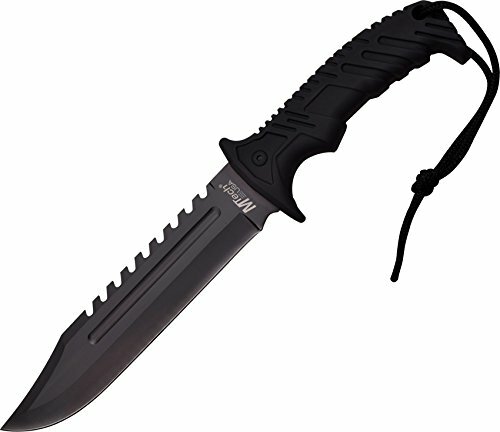 This tactical knife has a black rubber coated handle with finger grooves for comfort. There is also a lanyard cord on the end. It comes complete with a black nylon fiber sheath. MTech USA offers a diversified lineup of tactical folding knives, fixed blade knives, archery products, and security items -- all at competitive prices. If you have any questions about this product by MTECH USA, contact us by completing and submitting the form below. If you are looking for a specif part number, please include it with your message.